Hope House is pleased to accept referrals for immediate support and treatment at our Augusta, GA facility. Our GA STRONG (Standing Together in Recovery to Overcome and Nurture Growth) Program includes specialized treatment services for pregnant and postpartum women. Our clinic is nestled on a four-acre quiet, suburban setting designed for accessibility including local bus routes. Just 10 minutes from downtown Augusta, this location provides opportunities for participants to access parenting services, substance use treatment, case management services, family reunification counseling and peer support. Specially trained staff provide the appropriate amount of support and services while encouraging participants the opportunity to embrace goal-setting while they continue to move along our continuum of recovery and addiction support programs for women, children and their families. Contact us with any referrals (706) 737-9879 extension #207. Our goal on #GivingTuesday is to raise $5,000 for our Women’s Treatment and Recovery Support Services and Therapeutic Childcare programs here at Hope House. Hope House is the only recovery facility in 13 surrounding counties that allows children to live at the facility while their parents are in treatment. Parenting classes are mandatory for all of our participants with children. Our Therapeutic Childcare Center is more than a daycare. We evaluate the psychological, emotional, and mental needs of these children to set them on the path of making healthy and constructive decisions for their own lives. We've served more than 400 children and have seen 100 babies born drug free to participants. For every $1 invested in substance use disorder treatment, taxpayers save at least $7.46 in costs to society. At Hope House, we have the ability to positively impact the lives of children under our care and set the example for healthy living. Thank you for your support, love and kindness!! You can donate on 11/27/18 via this link or on Facebook by visiting our page and selecting the donate button under our cover photo. Because many of the women that enter our program are homeless or low- income, they come with very limited resources. Many families enter with the clothes on their back or just a few bags of belongings. To provide gifts for the holidays for our children and families, such as age-appropriate toys, coats, and other basic necessities, we are seeking local partners to help fill this need. Each donation is tax deductible and receipts are provided upon request. Please contact Chaz Butler via email cbutler@hopehouseaugusta.org or by phone (706) 737-9879 ext #210 for more information! "For many women living with opioid addiction, incarceration, and the rush to get high again afterward, can be a death sentence. More than one study places the risk of overdose death in the first two weeks after release at more than 100 times that of released inmates without substance use disorders. The problem is compounded by the relative lack of female inmates compared to their male counterparts. Fewer women arrested means fewer resources for helping women transition back into society." 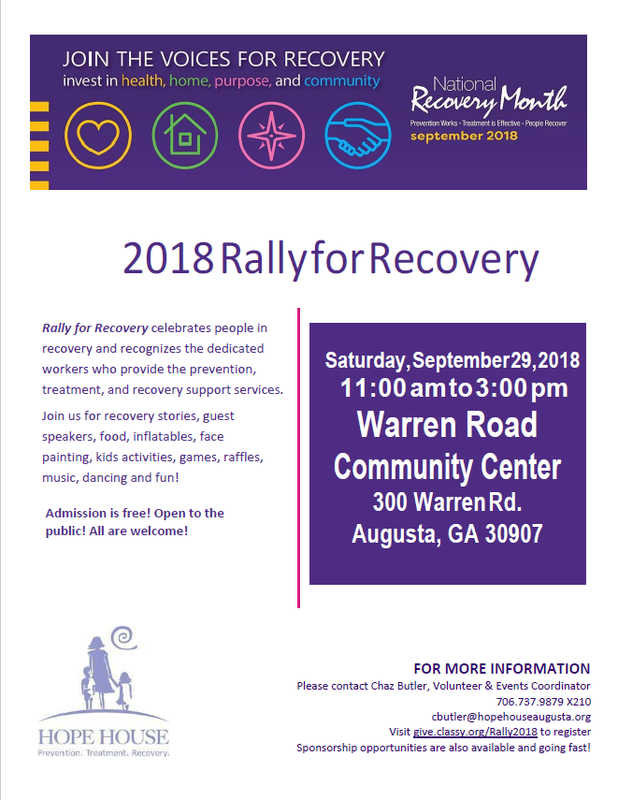 Rally for Recovery celebrates people in recovery and recognizes the dedicated workers who provide the prevention, treatment, and recovery support services. Join us for recovery stories, guest speakers, food, inflatables, face painting, kids activities, games, raffles, music, dancing and fun! The Playground Ball!! Join us, proceeds support local treatment facilities! Hope House, Inc. is a treatment facility for women living with a Substance Use Disorder (SUD) and/or mental health disorders. Hope House strives to instill self-sufficiency in individuals and families through comprehensive treatment to end the cycle of substance misuse, untreated mental illness, and poverty. Hope House is the only treatment facility in Georgia within a thirteen-county radius that provides residential and supportive services to the children of these women, while they are in treatment. In doing so, the organization aims to fulfill its mission of providing comprehensive rehabilitative services to the entire family. The organization strives to create sustainable change within these families through recovery-focused behavioral health counseling, teaching women to manage their disorders through adopting healthy coping skills, increasing each woman’s drug awareness and education, and teaching each woman soft skills needed to obtain gainful employment. Hope House’s ultimate goal is to help each woman become self-sufficient and re-enter society as a productive citizen. Hope House, Inc. is requesting proposals to build a family center on campus by renovating an existing 20 by 40 foot open air pavilion. The proposal shall also include the cost to renovate our front lobby and welcome area. This area will need new lighting, a new door installation and some small renovations to create more space. This area is approximately 134 square feet. The family center would need plumbing for handwashing and some electrical work to install electrical outlets as well as a separate heating and air conditioning unit. Drug overdoses have outpaced automobile collisions as the leading cause of accidental death in the United States. Although most overdoses occur in the presence of others, fear of arrest and prosecution prevents many people from calling 911. Georgia’s Medical Amnesty Law protects victims and callers seeking medical assistance at drug or alcohol overdose scenes. You can get a Naloxone (Narcan) rescue kit and be trained in its use. Click here to learn more and meet one of your local distributors! If a person is still alive, there's hope. Hope House is proud to be one of the founding agencies for Augusta's local recovery community organization (RCO), Focus on Recovery. Focus on Recovery in Augusta is designed to empower individuals and families in or seeking recovery from substance use disorders and other mental health challenges to lead secure and healthy lives. Focus on Recovery in Augusta is that individuals and families in or seeking recovery enter long-term recovery through a strength-based pathway for a healthier individual, family, and community overall. Georgia’s Definition of Recovery: Recovery is a deeply personal, unique, and self-determined journey through which an individual strives to reach his/her full potential. Persons in recovery improve their health and wellness by taking responsibility in pursuing a fulfilling and contributing life while embracing the difficulties one has faced. Recovery is not a gift from any system. Recovery is nurtured by relationships and environments that provide hope, empowerment, choices and opportunities. Recovery belongs to the person. It is a right, and it is the responsibility of us all. Want to get involved? Visit http://foraugusta.org/ or join us for our monthly teleconferences with dial-in number: (515) 604-9536 and access code: 479881.